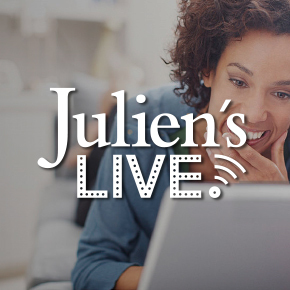 Property From The Collection of Hugh M. Hefner Items being offered in this online only auction starts closing at 11:00 a.m. Pacific Time on Monday, December 17th exclusively at www.julienslive.com. 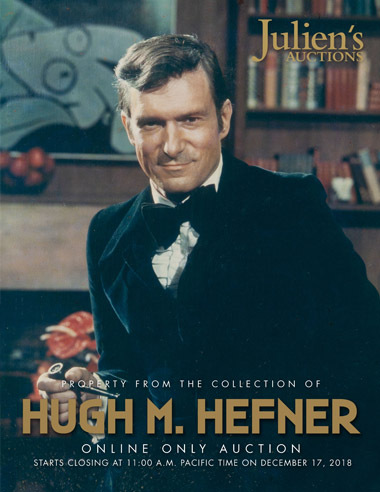 The online only auction is for his legion of fans who might have missed out on the live auction giving everyone a chance to bid and hopefully go home with something Hef himself owned. Fun highlights include Hef’s tuxedo with a label reading in part “Styled for Hugh M. Hefner” estimated at $600-$800, Hef’s custom-made red velvet smoking jacket estimated at $800-$1,200, Hef’s straw hat with cute bunny ears estimated at $150-$250, Hef’s Black Jack table from the ‘Game Room’ at the Mansion estimated at $600-$800, a Hef-painted and signed classic gumball machine estimated at $200-$400, and a 1980 “Hef Jr.” robot by Futaba with a Sony screen and Audiovox speakers that greeted guests and ferried drinks. This is just a small selection of pieces being offered from the legend’s famous home in Holmby Hills, all of which you can bid on now. This is the opportunity to have a piece of Hugh Hefner’s enduring legacy with 100% of the proceeds benefiting The Hugh M. Hefner Foundation.